10 years ago, Sam Raimi’s SPIDER-MAN sparked a Hollywood revolution - one that has lead to Earth’s mightiest heroes dominating the world’s theatres every summer. Had Tobey Maguire’s portrayal of Peter Parker failed to ignite the box-office, where would we be now? Would Nolan’s Batman have ever faced-off with The Joker? Would The Avenger’s assembly have just remained a pipe dream? Perhaps superhumanity’s cinematic assault was inevitable, but the impact of the likes of X-Men and Spider-Man cannot be understated given the current climate of Hollywood. Was it necessary? Well, that depends on who you ask. The box-office returns would suggest that it was, and with two sequels in the pipeline, Spidey is back in swingin’ form as if he’d never left the big screen. Spider-Man introduced a new generation to DANNY ELFMAN, and perhaps THE AMAZING SPIDER-MAN is Hollywood’s roundabout way of reminding the world of JAMES HORNER’s many talents. HORNER was a surprise choice to many, given his back-catalogue being almost entirely devoid of anything like Marc Webb’s superhero adventure. It wouldn’t be the first time that JAMES HORNER has been written off, only to prove the doubters wrong, but how would he fare with New York’s greatest hero? 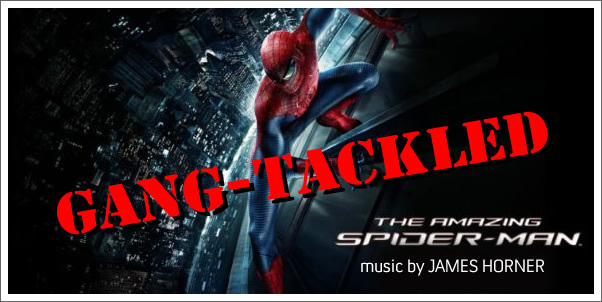 The Tracksounds gang swing in to provide judgment in this gang-tackle review of JAMES HORNER’s THE AMAZING SPIDER-MAN.